Earlier today, Microsoft announced a new “Your Phone” feature that is intended to further integrate an Android or iOS smartphone to your PC. The Your Phone feature looks incredibly promising, offering greater integration between your mobile device and your Windows PC than ever before. Unlike previous implementations of phone integration with the platform, you’ll be able to see things like text messages, photos, and notifications right on your screen. The Your Phone feature allows users to read a send text messages, drag and drop photos from your phone and place them into documents that you’re working with on your PC, and even see your phone’s entire list of notifications. It is shaping up to be an excellent productivity feature – allowing those in an office to seamlessly transition from mobile to desktop as needed. The main idea with the Your Phone feature is to ensure that users don’t have to constantly swap back and forth between their PC and phone in order to get things done, and the features we know of thus far certainly seem to position the feature to do just that. You can see everything you need from your smartphone right on your PC – allowing you to get work done wherever and whenever without any annoying additional steps. Microsoft has stated that the Your Phone feature will be coming to Windows Insiders for testing very soon, and it appears as if the latest Insider build already has the Your Phone app preinstalled – although at this point it doesn’t seem to do anything new. We haven’t received any word as to when the Your Phone feature will see a worldwide launch, but there’s a possibility it will be included in the Redstone 5 update later this year. The idea of bringing Android and iOS functionality into Windows 10 is part of Microsoft’s plan to start interfacing with existing technology rather than trying to build their own. The Windows phone failed spectacularly, so the choice to develop features that supports more established devices is a welcome change that many are looking forward to. As part of a commitment to better supporting the iOS and Android operating system, Microsoft has also announced upcoming integrations with Timeline which will even further expand the integration between the mobile operating systems and the most popular computer operating system in the world. Now that the dream of the Windows phone seems to be dead for Microsoft, it will be interesting to see how they can use some of their development resources to better interface with mobile phones that people actually use. 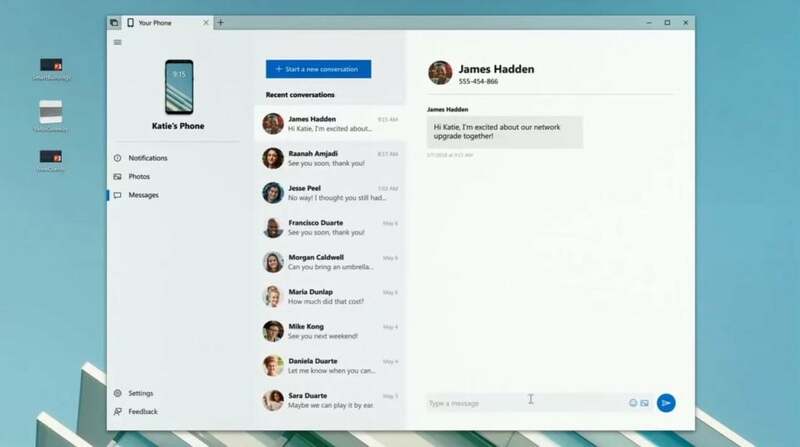 We’re excited for the future of collaboration between mobile and desktop operating systems and are interested to see what else Microsoft has in store.